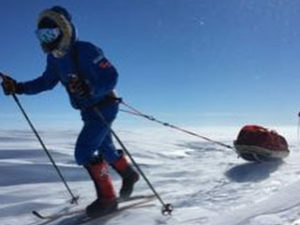 A team of five Army Reservists have reached the end of their 1,100-mile crossing of Antarctica, after 67 days on ice, making them the first British Army team in history to do so. A full crossing on the continent on skis, without any assistance from vehicles, or kites, has never been completed by a British team, and it is a feat completed by only three people ever before them. The crossing is so rarely attempted due to the physical endurance required to withstand pulling all their own food and equipment, extreme temperatures down to -50, high altitudes and crevasse fields. The team also completed the final route of Polar adventurer Henry Worsley, who sadly died attempting his own solo crossing last year. South Pole Expedition Army Reserves (SPEAR17), was a team of six led by Lou Rudd, who reached the South Pole on a previous expedition with Henry in 2012. SPEAR17 reached the South Pole on Christmas Day, and then continued across the Polar plateau and down the Shackleton Glacier, completing Henry’s route. The team started at Hercules Inlet, and set out on a 730-mile unsupported trek to the South Pole. At the Pole, they took on a resupply, and sadly said goodbye to Alun George, who was deemed medically unfit to continue. They continued a further 400 miles across the desolate Titan’s Dome, and down onto the Ross Ice Shelf, where they will have to build their own runway in order to be recovered by the Twin Otter plane. Leaving the UK in October, and spending 67 days living on the freezing wastes of Antarctica, the expedition was planned down to the last detail, from how many calories each member will need to consume daily, to the application of the latest innovations in equipment and technology. Team members Ollie Stoten, Alex Brazier, Jamie Facer-Childs, Chris Brooke and Alun George all undertook the rigorous trip, during which the team hauled their food, clothing and shelter for their journey on the ice in specially made pulks (sledges). SPEAR17 is hoping to raise 100,000 in aid of our charity. Donations can be made on their JustGiving page at https://www.justgiving.com/fundraising/spear17.